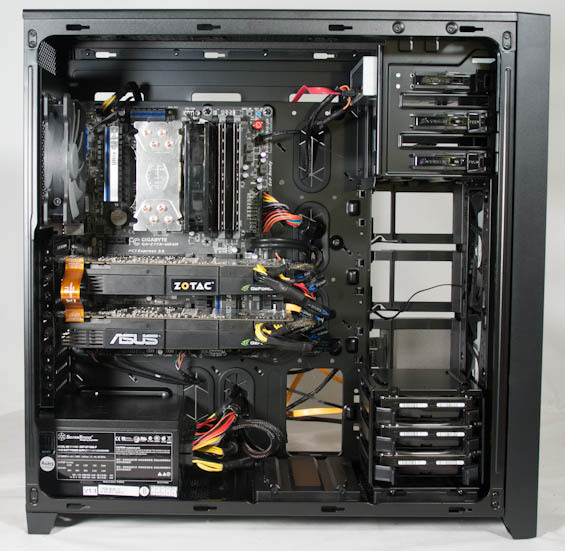 If it weren't for the weight, assembling a system in the Corsair Obsidian 750D would almost be like a vacation. Corsair's trademark at this point is ease of use, and that continues with the 750D. The side panels are both hinged and held in place with two thumbscrews. From there, installing the I/O shield and motherboard is easy; Corsair has extruded all of the motherboard mounting points from the tray itself, and added a guide peg in the center. 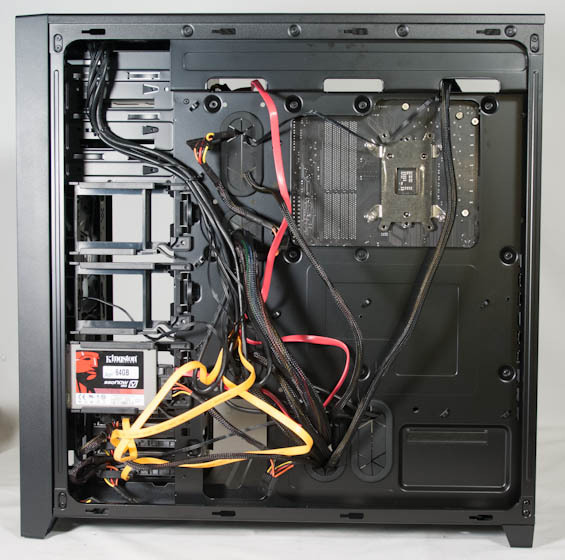 There's also plenty of space surrounding the motherboard, making it easy to route cabling. With all of the different drive form factors having toolless installation, you can imagine how easy that was to handle as well. The 3.5" drive trays are typical of Corsair, but they snap in nicely and securely (as opposed to the NZXT trays which have a hard time staying in place). NZXT handily beats Corsair's toolless retention mechanism for the 5.25" drive bays, though; Corsair's isn't bad, but NZXT's is incredibly secure. You'll probably want to screw in the drive on the opposite side just to be safe. 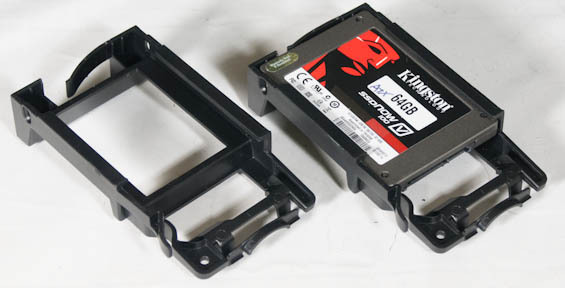 Corsair has been pursuing toolless mounting solutions for 2.5" drives pretty aggressively; they use modular, interlocking drive caddies for the Carbide Air 540, and those work well. With the 750D they have an even more novel approach, with a series of caddies that bridge the motherboard tray and front of the case. This system is also a pretty effective one, but if you're using a 7mm drive it's going to be a little loose. I'm not sure what they can really do about this. Create tiny drive cages and tiny drive trays that snap in on the sides? The arrangement of the 2.5" caddies behind the motherboard tray in the 750D is slick, but their alignment complicates cabling somewhat. The power supply and expansion cards went in easily and smoothly, and cabling for the most part was a non-issue. Corsair's creative 2.5" drive solution does cause some minor problems, though. You can see where the bottom drive caddie would be that the cables from the 3.5" drives bunch up, and that's ignoring how the front fan cables have to route through one of the other caddies. The fan cables aren't a major issue, but the leads for the 3.5" drives are a problem waiting to happen. Kudos to Corsair for coming up with an innovative arrangement for the 2.5" drives, hopefully they can work out some of the kinks in a future revision. For how hideous my cabling job is, Corsair designs continue to lend themselves well to very clean interior builds. As a teenager I was huge on the idea of having a windowed case, then through most of my twenties I was interested in having a more modest machine. As I've gotten older (and broken thirty) and case designs have gotten more elegant, I've started to see the appeal in having a slightly more showy build. The 750D's window is welcome; it's able to handle our full fat testbed with aplomb, and makes even my crappy wiring look decent.